The dominance of the SEC has never been about parity. But maybe that’s changing. Ole Miss beat Alabama 23-17, ending with Blake Sims throwing an interception while Bo Wallace managed not to ruin anything for the Rebels, ending a long drought in this rivalry and perhaps providing the school with its biggest win in a generation. Blake Sims, on 2nd and 13 with less than a minute left, made a big heave and tried to save the day. It was intercepted in the end zone by Senquez Golson, making an impressive catch. At first, on the field it was ruled as out of bounds, which meant Alabama still had the ball. 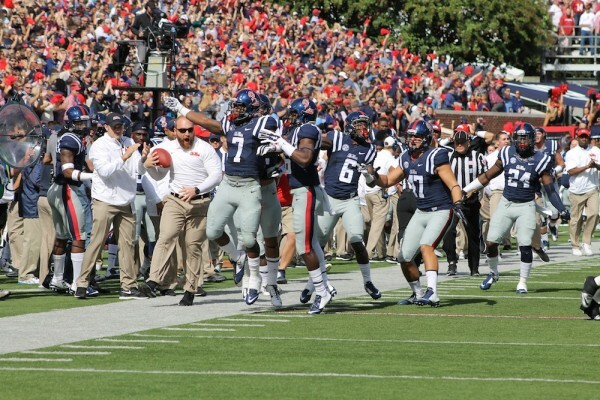 However, reviews showed that it was a good catch and stayed in the end zone, which meant Ole Miss had the ball for the final 37 seconds of the game, and meant it was time for the fans to storm the field, which included taking down one of the goalposts. Alabama actually enjoyed bad officiating and the rules of some plays not being possible for review in the second quarter. Ole Miss’ offense struggled through the first half, scoring just three points. Cyrus Jones stripped the ball out of the hands of I’Tavius Mathers and returned it 13 yards for a touchdown. However, the replays showed Jones grabbing Mathers’ mask which turned the stadium into one huge chorus of boos, but it didn’t change the fact that Alabama were ahead 14-3 at halftime. 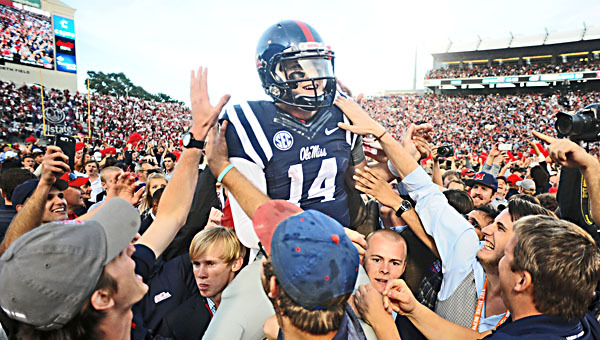 Bo Wallace is never going to be a quarterback that fills his head coach or fans with trust. He is a gunslinger at heart, even though he sometimes manages to stay away from that. In the second half he completed three touchdown passes while the Ole Miss defense held Alabama to just three points, denying them a touchdown for over 33 minutes. Blake Sims, who looked so good against Florida, was denied throwing a single touchdown pass. Wallace connected with Laquon Treadwell to make it a one-score game, and in the fourth quarters, on consecutive drives, found Vince Sanders and Jaylen Walton for the touchdowns that tied the game and eventually won it, although their two point conversion failed which put a lot of pressure on the defense as Alabama set out on what turned out to be their final drive. The defense, and specifically Senquez Golson, held on and made the big play to end all the fear. Hugh Freeze was obviously elated at the end of the game, as Ole Miss have started the season at 5-0 for the first time since 1962. This is a program with very few good days in recent history, taking a backseat to LSU, Alabama and Auburn in the SEC West. But Freeze’s recruiting since 2012 has been one of the best in the nation despite the inferiority when it comes to title and rankings claim compared to other teams in the division. At going 7-6 followed by 8-5, suddenly this year looks very different. Alabama? Nick Saban said it’s about getting a response from his players. Amari Cooper wasn’t shut out of the game, but he didn’t have any touchdown catches. His defense failed in the biggest moment. T.J. Yeldon had a big game, but Derrick Henry averaged just 2.2 yards per carry. This is a good team, but not a special one. They’ve looked less than impressive in games against worse teams than Ole Miss this season already. The upset that brought them down to real size was simply waiting to happen.